C151 Smart Villas hosted a Cocktail Evening for current partners and potential local and international tour & travel agents on Friday, the 7th of February 2014. The gathering, which was attended by forty well respected agents, was a show of appreciation for the long term relationship, between C151 and its loyal agents, both for past work and future opportunities. It also aimed to refresh the product knowledge and highlight the “smart – luxury” concept of C151. 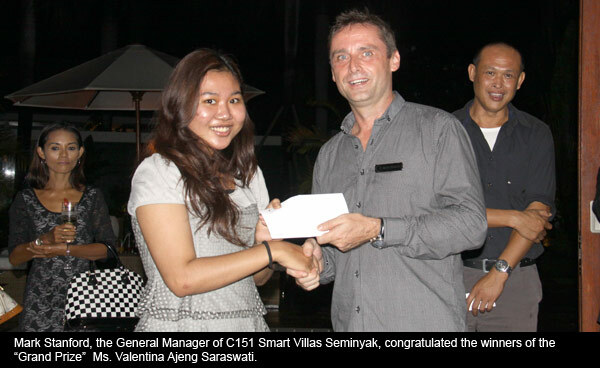 During the event Mark Stanford, the General Manager of C151 Smart Villas Seminyak, congratulated the winners of the “Grand Prize” who were represented by Mr. Ray Wijayakusuma (BIWA Tour), Mr. Boy (Universal Tour & Travel) and Ms. Valentina Ajeng Saraswati (Dwidaya Tour). The Grand Prize included stays with C151 Luxury Villas. C151 Luxury Villas Dreamland is situated on the southwest coast of the southern tip of Bali commanding unrivalled personal views over the majestic Indian Ocean. A new era of elite luxury awaits the privileged from around the world as five stunning cliff top villas in the Dreamland area. C151 Smart Villas Seminyak is in the central “uber” cool location of Seminyak, which is ideal for shopping and experiencing the high end of society while being on the Island of Gods.